I received a 141(5) left turn violation for an accident. I was making a left turn across three lanes of traffic. The nearest two lanes were stopped for a traffic light up ahead of them and behind me. The third lane was a "right turn only" lane. As I made the turn, I saw a car pull out around the stopped traffic and enter the "right turn lane", so I stopped with my nose in the lane, but instead of turning right (which would have easily avoided an accident) he went straight through the intersection from the right turn lane. He just clipped the front of my bumper. The other driver moved his vehicle 5-10 feet before the police arrived. The news cameras and photographs show the original position. Unfortunately, when the police arrived they only spoke with the other driver and allowed them to leave the scene before speaking with me. I didn't speak with the officer until we were at the Collision Repair center (the tow truck driver had driven away with the vehicle & she needed to see the vehicle). At the time, she issued me the 141(5) ticket before asking me any questions or taking a statement. She said the other driver told her he was not turning right but going straight to the next intersection. I asked her why he wasn't issued a ticket and found at fault for disobeying the sign and was told by her that he didn't have to turn right. He could go straight or turn right. Reg 615.34.1 reads "34. (1) A Lane Designation sign shall be used to indicate by means of a single arrow or a combination of arrows the only permitted movement or movements by vehicles on one or more lanes of a highway marked with the sign. R.R.O. 1990, Reg. 615, s. 34 (1)." It seems very obvious to me he violated that sign and should have been ticketed under 182(2). Am I reading this correctly and using the appropriate statutes? When I continued talking to the officer she didn't recall if the right hand lane was a "right only lane" or a "right and straight lane". We had already left the scene. I have the photographs to show it was a "right only lane". (1) Will the driver's violation of 182(2) usually be enough to drop the charages against me under 141(5)? (2) Is there any way after that accident that the other driver can be charged under 182(2) and be found at fault. It seemed very clear to me when the accident occurred that this should be what happened, but it was snowing, it was rush-hour and the police just wanted to clear the scene quickly. The reason I called the police was I strongly believed the other drive was at fault and I didn't want a no-fault accident. It went horribly wrong, obviously. Can you provide us a Google Streetview Link or give us more details on where this intersection is and what exactly you did? Even if the other driver committed an offence you also did and his offence happened after yours. The charge fits the event. cibinv wrote: Even if the other driver committed an offence you also did and his offence happened after yours. The charge fits the event. Not sure I follow, especially how the OP was the first to commit an offence. If the other driver illegally used a right turn lane as a through lane, I think that would be a good defence in Court. Yes, that diagram is an accurate description of what happened. I pulled up the google maps and placed the vehicles on the map. I have photos of all the vehicle positions (the RAM pickup that hit me moved his vehicle before the police arrived). The tractor trailer was blocking both the center and left lane, stopped waiting for the light. The tractor trailer driver was interviewed by the news reporter, who reported that he was intentionally blocking both lanes because he needed to make a wide left hand turn from the middle lane at the intersection after the intersection where the accident occurred. In the TV interview, the tractor trailer driver said the RAM pickup hopped out from behind him to pass him on the inside. These are the lane signs posted on the pole before the intersection. This is the front view of the accident. It shows the RAM pickup in the right lane & the cab of the tractor trailer in the middle lane. This is the rear view. It again shows the RAM in the rear lane. I believe the position of the RAM is important because by the time the police arrived, the RAM driver had already moved the vehicle. This is a picture from the news posted to twitter. It shows the position of vehicles in the intersection. The wheels of the RAM are pointed straight and the impact occurs in the middle. If the RAM was turning right, the impact would not have occurred in that position. The RAM driver voluntarily told the police officer he was going straight through the intersection. Are these images valuable? Do these images support the conclusion that the accident happened because the driver of the RAM pickup failed to obey the right hand turn sign and proceeded straight through the intersection? The lane that the Ram pickup is in is for turning right at Bath Road further up or right onto Golden Mile Road. The appropriate charge was laid in my opinion as you were turning left across traffic having the right of way. I agree, the sign is not applicable to the intersection where the accident occurred. As such the other driver's actions were lawful. Ok. Thanks for your comments Decatur and Stanton. Since the right hand turn sign is posted before the first intersection, I believed that the signage applied to both intersections, hence if you were in the right lane before the first intersection, you had to turn right there and did not have the option to go straight. I know the intersection very well and have always treated the right lane as a turn inly lane approaching that intersection myself. The right lane starts about 100 ft before the first intersection but because of the snow being piled up in the right lane, you couldn't enter right until just a few feet before the first intersection. To legally change lanes from the Center lane to the right lane, the driver would have needed to use his right signal light, correct? This vehicle was easily travelling 40-50 km/h and we're talking about a distance of just feet. If he made the lane change legally while signalling, his right signal light would have been on while going thru the first intersection in the right lane. 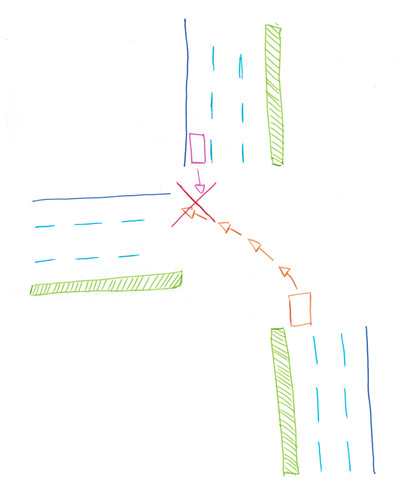 Even if the sinage applies to the second intersection, wouldnt a right signal light have obligated a right turn at the fist intersection? And if he didn't use a right signal, wouldn't that mean that he made an illegal lane change without signaling in the immediate 1-2 seconds prior to the accident. I'd appreciate any feedback on this line of questioning. TimmyOne wrote: wouldnt a right signal light have obligated a right turn at the fist intersection? No. If someone is traveling straight they aren't obligated to do anything based on their own signals. You have to assume they are going to continue whether there's a signal or not. The onus is on you to make a turn only when it is safe to do so. You can't drive based on signage that may or may not be visible to drivers going the opposite direction. When turning left you can't assume the signs are there or were seen. For all you know the sign could have been snow covered, recently changed or eaten by gremlins. Friend you are grasping on this line of questions, you need a new defence. Now that I have a better picture of what happened this still looks like the charge fits the event. You can't deflect fault and use "what if's".